Shiksha Vibhag Lecturer Jobs Applicant must have to complete PG. 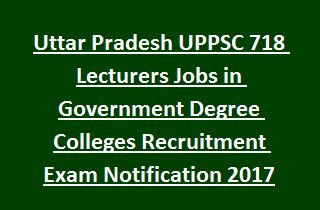 There are total 718 Lecturer Jobs available in UPPSC recruitment 2017. Candidates who are willing to apply for UPPSC Degree College Govt Lecturer Jobs must have to visit the official website www.uppsc.up.nic.in. Submit the application forms before 24-11-2017. Selection for this UPPSC Higher education Department/ Shiksha Vibhag Lecturer Jobs is based on Screening test and Interview. Further details regarding this Uttar Pradesh Public Service Commission UPPSC Higher Education Department and Shiksha Vibhag Lecturer Jobs Recruitment Important dates, educational qualifications, Age details, selection process, how to apply and other info are given below. Total Lecturer vacancies available in Higher Education Department and Shiksha Vibhag of UPPSC Recruitment are 718 posts. -Also qualified NET/ SET/ SLET in relevant stream. Phd qualified candidates are eligible to apply. UP Shiksha Vibhag Lecturer Jobs: Applicant must have Post Graduation qualification in relevant subject. Candidates must have age limit between 21 years to 40 Years and age relaxations are applicable as per UPPSC Norms. Application Processing fee for OBC and General Candidates is Rs.25/- and Examination fee is Rs.80/-. For SC/ST candidates application processing fee is Rs. 25/- and Examination Fee is Rs.50/-. UPPSC Commission will select candidates for Lecturer Jobs through direct recruitment on the basis of Interview. The commission will shortlist candidates for Interview by conducting screening test. UPPSC Government Lecturer Jobs Exam Pattern & Syllabus details will be uploaded soon. UPPSC online application forms available at www.uppsc.up.nic.in. This online application link opens from 24-10-2017 till 24-11-2017. Candidates who are interested for this UPPSC Higher Education Department and Shiksha Vibhag Lecturer Jobs are required to submit applications with mandatory documents, Photo Images and Signature copy before last date.